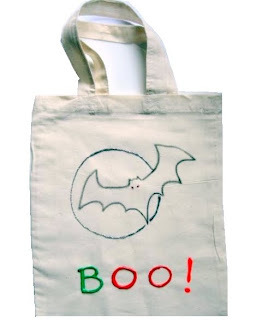 I just love these special Halloween personalised cotton bags. Made from unbleached cotton, they are environmentally friendly and long lasting. They are perfect for Trick or Treaters and Halloween Parties. Each bag has a menacing bat with red eyes, flying in front of a silver glittery moon. You can have the bag personalised with a name, or choose from the list of possible messages from the dropdown menu. You can see these personalised halloween party bags in our Halloween party products section.